ZAOR MIZA RACKS come in two sizes (12 or 16 rack units) and complement the series with some further rackspace for 19" rackable gear. Admittedly, the amount of outboard is shrinking, but there are still a large number of you out there who own a nice Armada of external processors, keyboard expanders, converters, CD/DVD players, tuners, power conditioners and UPS (not the shipping guys but uninterrupted power supply for PCs ) and much more. 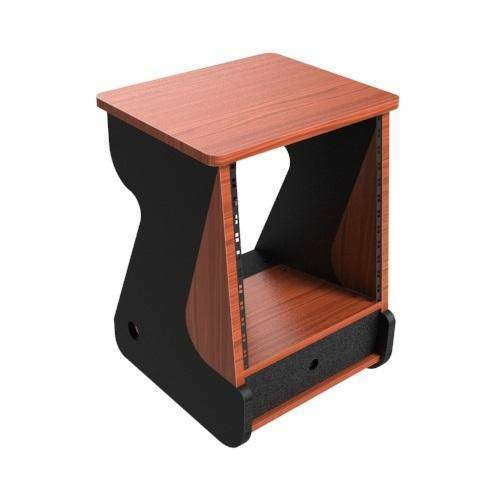 So when the main vintage gear has taken up all the space in your workstation, and you need more space to put all of this equipment, the MIZA Racks come in handy, at a reasonable cost and yet with a fresh designer look, that goes well with other MIZA elements such as the MIZA station, the keyboard workstations or the stands. With an open architecture, heat is not a problem, plenty of airflow through the rack gives you enough circulation to keep your 'babies' nice and fresh. In the back, the practical cable rail allows to put order into your whole connectivity, so it doesn't look like a jungle behind your furniture.